Book readings at Green Genes Reviewed by Edgeville Buzz on September 8, 2010 . Chicago, IL, September 1, 2010 – – Environmental Expert and Green Business Owner, Alexandra Gnoske, has published an inspiring green themed children’s book, Loui Saves the Earth, and will be reading it this fall at Green Genes (5111 N. Clark St.), in Andersonville, every other Tuesday, beginning September 14th at 1030am. Gnoske, who has a degree in wildlife biology and Juris Doctorate in environmental law, takes her passion for nature and wildlife and creates a brilliantly simple story that lets kids know they can make a difference for Planet Earth. The main characters, Loui and (his dog) Dusty, find the planet and animals are in trouble. They decide to stand up, take action, and get everyone to help too! 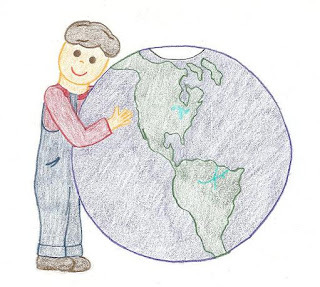 Even though Loui is just a little kid, he shows us that, no matter how old you are you can help the planet, inspiring children of all ages. Green Genes shares Gnoske’s passion for helping people make simple changes that are good for them and the planet. Green Genes is an eco boutique known for its great selection of environmentally responsible products. “I’m excited to read my book at Green Genes as it is right around the corner from where I grew up, and a store that promotes the kind of products I believe in,” says Gnoske. “I learned a lot about nature right here in Andersonville.” She will also be signing books, a perfect gift to inspire future literary geniuses, and will have eco friendly book marks and stickers, made right in Chicago, available. Gnoske welcomes questions, and loves to help families find new ways to green their lives. Gnoske is also the founder and owner of RECYCLE MEâ, an organic cotton clothing company in Chicago. She decided to develop an organic clothing line after learning about the amount of pesticides used in growing conventional cotton. “It can take up to a third of a pound of pesticides and synthetic fertilizers to grow enough cotton for one t-shirt,” she says. “I believe consumers deserve a safe and healthy choice.” You can find some of her organic clothing for sale at Green Genes. For information on upcoming readings/signings visit www.louisavestheearth.com. Loui Saves the Earth is available on amazon.com. For more information on organic cotton visit www.recyclemeorganictees.com.